Drs. 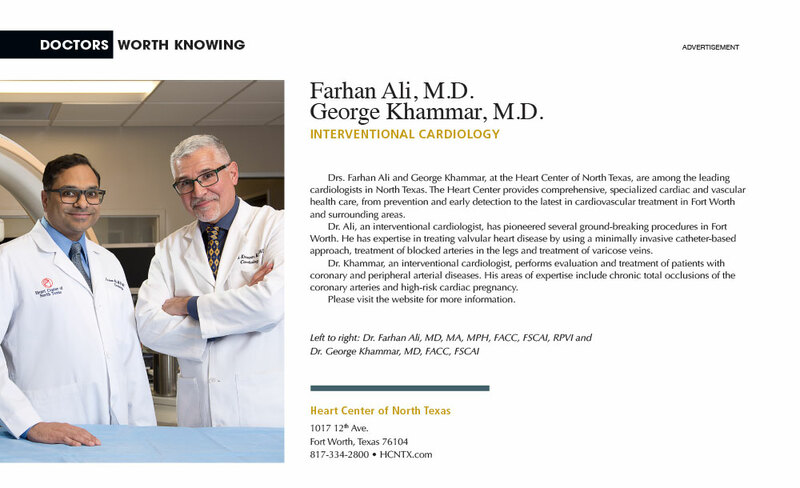 Farhan Ali and George Khammar, at the Heart Center of North Texas, are among the leading cardiologists in North Texas. The Heart Center provides comprehensive, specialized cardiac and vascular health care, from prevention and early detection to the latest in cardiovascular treatment in Fort Worth and surrounding areas. Dr. Ali, an interventional cardiologist, has pioneered several ground-breaking procedures in Fort Worth. He has expertise in treating valvular heart disease by using a minimally invasive catheter-based approach, treatment of blocked arteries in the legs and treatment of varicose veins. Dr. Khammar, an interventional cardiologist, performs evaluation and treatment of patients with coronary and peripheral arterial diseases. His areas of expertise include chronic total occlusions of the coronary arteries and high-risk cardiac pregnancy.